In the wee small hours of this morning, in my usual insomniac time, I finished my Squidoo lens about Adam Lindsay Gordon, a famous Australian poet of the 1800’s. As always, my research took me in many and varied directions – which I find I love – always something more to learn, to ponder or ‘moodle’ about. In 1859, the ship SS Admella foundered on a reef at Carpenter Rocks in the SE of South Australia, and broke up on the rocks, causing a heavy death toll, with few survivors – and a horseman made the frantic dash from the coast to raise the alarm and get help from Mt. Gambier, some 26 kms. away. One of the interesting things I discovered in my research this time, was the conflicting reports of who actually was the rider. 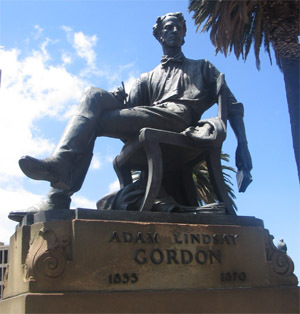 Three names have come up – one of them Adam Lindsay Gordon, himself. But as I suggest in my lens, he had not bought his famous home ‘Dingley Dell’ at that time, and I cannot find any other mention of it being him. telling the story of this heroic ride. And equally sure, is its highly descriptive and emotional power that never wanes, no matter how much time passes. It is said that some of his poetry was not good, some quite mediocre – but the same critics are in total agreement that his best is extremely powerful and completely evocative of those days.